Nearly two decades have elapsed since the Japanese cinema explosion of the 1990s. The directors who led this wave; Kiyoshi Kurosawa, Hirokazu Kore-eda, Naomi Kawase, and Takashi Miike, are still among the industry's most high profile faces on the international festival circuit. As recently as the past two years, a new generation of filmmakers from Japan are starting to make themselves heard. This year saw the release of Ryusuke Hamaguchi's 5-hour domestic tranquility stunner, "Happy Hour", Koji Fukada taking home the Un Certain Regard Jury Prize at Cannes for “Harmonium”, and the rising indie animation figure, Makoto Shinkai obliterating the box-office competition with “Your Name". The movie going on to become the second largest grossing film in all of domestic Japanese cinema and internationally, the highest grossing anime ever released. All the while it's young director doubling over in humility in the face of its global success. North American audiences have had to wait the longest of its prospective markets, with the domestic distributor Funimation rolling out the film this month to theaters across the country. While the general construct (two teens exchange genders in their dreams and fall into one another's bodies in their waking lives), might lend itself to juvenile humor and ships passing-in-the-night cliches, over the course of the film's third chapter, this megahit animation discloses the true scale of its outsized ambition. In symmetry, the dramatic scope and sweep of its dazzling images escalates accordingly. The overriding concerns of "Your Name" are revealed to be a weighty mix of youthful pondering of mortality, the passing of time, irrevocable change and lastly, a stunning, apocalyptic awe. As Rich Motoko observes in his, "The Anime Master of Missed Connections Makes Strong Contact in Japan", although hit status is new for Makoto Shinkai, the structural construct and dominant themes of his newest film are not. Since his first feature length film, "Voices of a Distant Star", (which Motoko points out was created exclusively by the director, with the assistance of friends on a personal computer), Shinkai has explored the loss of connection between adolescents of both the present and future. Digital communiques disappear, calls don't go through, characters narrowly miss meeting on trains, timelines, hopes and plans made, fail to materialize. “Shinkai is a master at depicting and investigating the distance between people,” Jonathan Clements, the author of “Anime: A History” writes. He added, “He excels at allegorizing the way that human beings are separated by gulfs of yearning.” It is into exactly this expanse that Shinkai has projected his mix of modernity and tradition, one that to western minds, expresses itself in a quintessentially Japanese fashion. Kumihimo, the folk art of braiding colored silk is put to elegant service to depict the flow of time itself. A metaphor of the "gathering of threads" that came to the director in his reading on Superstring theory. The film's initial chapters watch as a charming and gently comic playing with what it means for an adolescent boy and girl to trade bodies. Depicted through a light toying with gender, "Makoto Shinkai Takes Adolescent Identity Crises to Extremes". While this may be a device de riguer in much of teen-focused anime, as Manohla Dargis' review makes clear, Shinkai soon complicates the story in a succession of other ways. What at first seem like contextual details (a Shinto temple, a shattered comet filling the night's sky, the chronology which the film's two protagonists occupy), these elements gradually shift, with increasing volition, from background to foreground. Mirroring the reversal of perspective and tone, the meaning of these two intersecting lives deepens, as consequence exerts itself and irreparable change to their world advances. In the assertion of these forces within the film, Makoto Shinkai, Studio Ghibli veteran Masashi Ando, and character designer Masayoshi Tanaka, execute a towering, soaring, heartbreaking reversal quite unlike anything seen in all of anime. Stepping up to fill the void left in the wake of Cinerama's now extinct(?) Sci-Fi Film Festival Paul Allen's state of the art theater with its Cinerama-Scope screen, Dolby Atmos sound and laser projection system, will host a 23 film overview of the last three decades of best that Japanese animation has to offer. Central to the Cinerama's Anime Movie Festival are the works of Takahata, Miyazaki, Tokuma, Suzuki and and the renowned animation house they founded, Studio Ghibli. While currently on a hiatus, involving a possibly permanent break from directorial efforts from Miyazaki, the British Film Institute addressed the legacy of this groundbreaking studio and it's visionary founders in their June 2014 Sight & Sound feature. Over the course of the issue's many-page sections, critics for the British Film Institute detail the studio's creation of a animation storytelling form of often astounding beauty and richness, their later global success, and the most recent news of their struggle to find a modern-day successor to the studio's iconic director, Hayao Miyazaki. Indicative of this impasse in 2015, "Studio Ghibli Announced a Break in Production", while they reassessed their current financial state, creative objectives and possible new directions for the studio. The Sight & Sound feature positing where the future of new non-commercial animation in Japan may arise, with Suzuki himself offering outspoken support for the Evangelion director and Khara maven, "Studio Ghibli Co-Founder Points to Hideaki Anno". With the global success of "Your Name", it's director has quickly ascended to the shortlist, with pieces like The Guardian's "Makoto Shinkai: Could the Anime Director be Cinema's New Miyazaki?" becoming increasingly common. Yet Ghibli are not inactive. While they have not issued directorial work of their own, the studio has offered financial production and technical assistance to two notable endeavors of last year. The first of them, Michael Dudok de Wit's ""Looking West for an ‘Eastern’ Approach" found in his award winning and dialog-less "The Red Turtle". The second, a more audacious endeavor, and first for the studio, "Ronia the Robber’s Daughter" has made for intrepid viewing in the currently climate of children's entertainment. Particularly so for its reliance on a more traditionally cinematic approach to editing, slower pacing and lack of merchandising tie-ins, "Studio Ghibli's first TV Show makes for a Wondrous World of Peril and Magic". 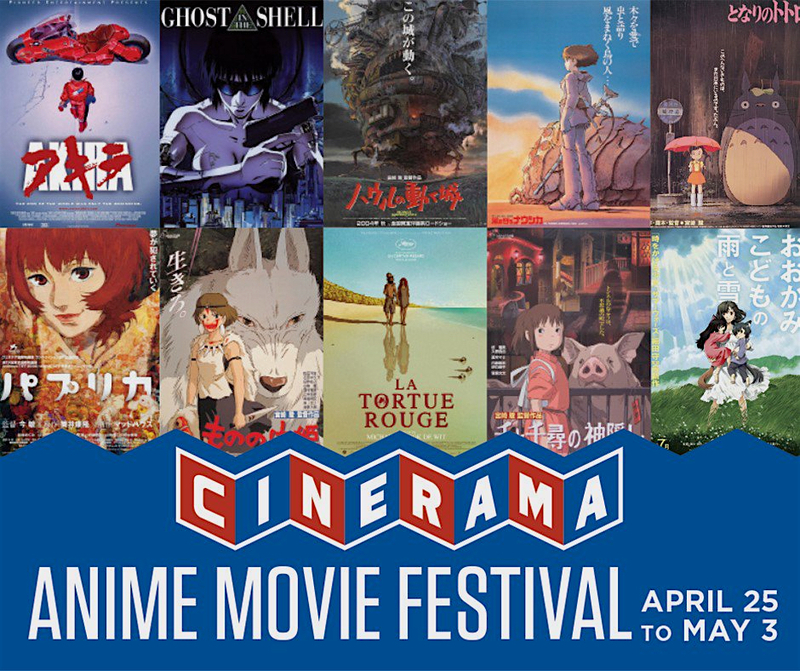 While featured dominantly in the Cinerama's Anime Movie Festival lineup, the selections on offer are not limited to Studio Ghibli alone. As the eye to groundbreaking, high quality programming seen in the full schedule of 23 films over the course of the festival's two week duration attests.